MVCAN Wag newsletter schedule for December: Look for your next edition on Thursday Dec 21st, followed by a January 4th New Year edition. Happy holidays from the Wag editorial staff! LAST SATURDAY WE HAD AN AMAZING TURN-OUT; ALMOST 50 VOLUNTEERS SHOWED UP AT OUR PHONE/TEXT BANK! The level of voter contacts was very high--thousands of phone calls and texts were made, hundreds of Alabama voters had direct contact with one of our volunteers. Thanks to all! Next, join us for the home stretch of the Alabama Special Senate Election on 12/12. In this critical phase of the election process, we will be holding three separate phone bank/text sessions. Please click on the eventbrite links below to register. This makes organizing easier for us to manage. Please bring your charged cell phone AND your laptop, iPad or tablet. Our experienced phone/text bank leaders will be on hand to coach you and train you. We need to Get Out The Vote! Mainstream Republicans have now decided to support Roy Moore with millions of dollars and endorsements, even in the face of his pedophilia & assault accusations, and general misconduct. This is when Doug Jones needs our support the most, to turn out voters on Tuesday, 12/12! We'll be using the automated dialing tool, Hubdialer. We’ve had a lot of good conversations with voters, thanks to Hubdialer automatically dialing through hundreds of voters to connect us. We hope the Alabama campaign will have lists for us to text, but even if they don't, we can text with Rapid Resist to red state voters asking them to attend protests/contact their members of congress against the Republican Tax Scam. You will need to fill out this form the day before you come to our phone/text bank to ensure you get a list for each day that you want to text: bit.ly/text-resist. Once you do that, please go to the App Store and download the HUSTLE mobile app for your phone. Thanks to those of you who attended the Rapid Resist fundraiser; your support was much appreciated. 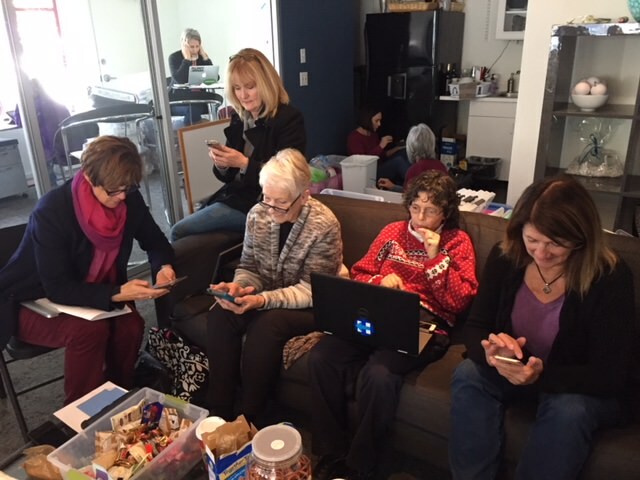 As many of you know, our texting partner Rapid Resist develops relationships with grassroots organizations all over the country in red and purple states. To help these groups activate their communities, Rapid Resist buys cell phone lists in those areas. Then we work with Yoni Landau, the founder of Rapid Resist, to text those voters to get them to events, such anti-Tax Scam protests or to get voters to call their members of congress. The people we text are often people we can't reach any other way. And once they are called to action, these folks move up to help organize their communities! So here's the thing, Yoni works with one other teammate to make this all happen and to buy the cell phone lists--which are expensive. We need to support Rapid Resist to keep it alive! Rapid Resist is one of our most invaluable activist non-profits. If you could not attend our fundraiser, please consider a small donation to bolster this much needed organization. 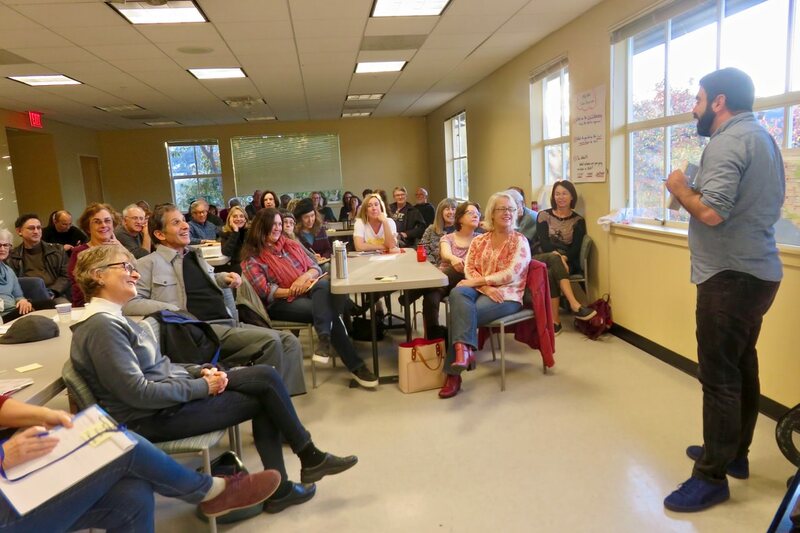 70+ MVCAN activists attended our December monthly meeting! (Photo by Fabrice Florin. See more MVCAN Meeting photos on Flickr). Ben talked about successes in Virginia in reaching out to millenials. NextGen registered 20,000+ new millennial voters. All millennial-dense districts in VA went 78% for Democrats, compared to 15% for Republicans in 2016. Young voters have made the difference in Democrat victories in the last few statewide elections in VA. When millenials, people of color, and other previously marginalized voters turn out, Democrats win! A key takeaway from Ben’s talk was that the great successes in Virginia are an example of the effectiveness of distributed grassroot groups, like NextGen. The MVCAN AIRLIFT fund is a contributor to the New Virginia Majority distributed grassroots group, which played a critical role in Virginia. The New Virginia Majority knocked on 189,000 doors this fall, promoting progressive candidates and turning out votes, primarily in Virginia's communities of color. We can help in California by supporting distributed grassroots efforts across the U.S. By doing our continued work of targeted phoning, texting and donating, we support the grassroots groups by freeing them up to do their vital work person-to-person and on the ground. Ben made note of the unique energy of mvcan. “I haven’t been in a room like this in a long time,” he told the overflowing crowd. Going Forward - Ben stressed the importance of starting election work early, which is exactly what MVCAN is doing. It’s never too soon! Each Action Team leader summarized accomplishments during 2017. Fabrice Florin introduced the new Events team, which emerged after the highly successful MVCAN-Do Revue Anniversary Fundraiser. Click on the team page links at the end of the newsletter to read highlights. ACTION: Contact Dianne Feinstein to ask her to pledge to support the Dreamers. Kamala Harris has already signed the Dreamer Pledge, Why not Dianne? AND, FOR BONUS POINTS, WHILE YOU ARE ON THE CALL ASK DIANNE FEINSTEIN TO DO EVERYTHING IN HER POWER TO OPPOSE THE TAX SCAM! AIRLIFT is MVCAN’s first national project. It gives people all over the country a simple, strategic way to donate to grassroots groups working year round in 2018 battleground districts. In addition to AIRLIFT’s 3 funds supporting designated grassroots groups, we will be suggesting additional, timely opportunities to give to savvy grassroots groups that can use our immediate help. This week we are letting you know how you can make a direct donation to help increase Black voter turnout in Alabama for the special Senate election on Dec 12. The Movement Voter Project, one of AIRLIFT's partners, is very close to the ground in Alabama and is funding 7 local black grass roots groups to get out the vote for Doug Jones. 30% of registered voters in Alabama are black. One of these groups is WOKE VOTE--an awesome black-led campus GOTV program led by the amazing DeJuana Thompson. WOKE VOTE launched 3 weeks ago--they hired over 150 organizers and printed over 2000 t-shirts to organize every major campus in the state--including Alabama's 12 Historically Black Colleges and Universities. Help set California's progressive agenda! You're invited to join us for the 2017 California Solidarity Conference in Oakland this weekend. The conference is being co-sponsored by the Daily Kos, CREDO, Rapid Resist, the Courage campaign, and many others. At the conference we will collaborate and strategize together across issue areas. We will take some time to reflect on what we've been doing, how we can do better, and what our vision for the future of our movement is -- so we can move forward into 2018 united and ready to win. Movement organizers, legislative advocates, policy experts, and issue campaigners from across the state will be getting together and discussing how to lay the groundwork for long-term systemic change in California and beyond. The California Solidarity Conference is not about preselected panels and presentations, but rather collaborative discussions and workshops, with topics put forward by people participating. The conference will follow an unconference format with session topics set by attendees at the conference itself. We’ll come together every day for plenary sessions and panel discussions, and for the rest of the time you will choose from dozens of participant-led discussions and workshops. Check out these links for the Conference Agenda, Conference Registration. Main Conference Website, and Directions. The Trump administration, rather than protecting our precious wilderness, is shrinking and destroying our national monuments. By removing protections for wild places like Bears Ears National Monument in order to open them up for private development, the Trump Administration is rescinding the public’s right to preserve and enjoy our natural heritage. For Native-Americans in particular, Bears Ears is a historical and sacred site. History shows that when states control these lands, they are sold to the highest bidder. DEFEND THE LAND WE HAVE LEFT! Join Marin Moms in a march to commemorate Sandy Hook and prevent gun violence. Event: March in the Demand Action Sandy Hook Vigil. Stand in solidarity with #YouthGov Plaintiffs, who are suing the Trump administration over climate change! There will be a hearing on Juliana v. US youth plaintiffs before the Ninth Circuit Court of Appeals Mon, Dec 11, 10am in San Francisco. Join in a rally during the hearing, outside the James R. Browning United States Courthouse in San Francisco, with a livestream of the arguments until the youth plaintiffs exit the courthouse. A press conference will follow outside to debrief on the hearing, at which some of the youth and their lawyers will speak. CLIMATE SCIENCE MUST HAVE ITS DAY IN COURT! The youth plaintiffs will call on the Ninth Circuit to lift the temporary stay imposed by a lower court. The three-judge panel will hear oral arguments from an attorney of the youth and an attorney of the federal government to determine whether the stay will be lifted, and the case can proceed to trial. 8 am - Rally as youth plaintiffs enter the courthouse. 10–11:30am - Rally during the hearing with a livestream of proceedings. 11:30am – Listen to press conference outside. Support #youthvgov and climate justice! The fossil fuel industry has been fighting to open Alaska’s Arctic National Wildlife Refuge to drilling for decades. The American people have been resisting every step of the way. Now, the Trump administration and Republican leaders in Congress are ready to hand this unbelievable place over to the oil industry. Here are two actions you can take to stop the exploitation of this unique wildlife refuge. Action: Sign an online petition. Tell Congress Now: No Drilling in the Arctic National Wildlife Refuge! Action: Gather signatures on a paper petition. Grounded in the nonviolent ideology of the Civil Rights movement, the 2017 Women’s March a year ago was the largest coordinated protest in U.S. history and one of the largest in world history. The first Women’s March was the heart and center of the protest against Trump, Republicans, and their continuing, reprehensible policies and governance. That first march was the spark that helped to ignite the Resistance and progressive movements. The original march led to the transformative rise of people in action, who are working to defend the real values of an America that deserves better than Trump. LET’S DO IT AGAIN IN 2018! Stay tuned for more details about MVCAN’s plan to attend. WHAT DID YOU THINK OF THE MVCAN ANNIVERSARY? If you attended our MVCAN Anniversary at the Throckmorton Theatre last month, we’d love to hear from you! Please take our short survey to share your feedback. It only takes a few minutes, and your comments will help us plan future events for MVCAN. To learn more, visit our new Events Team page. Or visit our anniversary page for more event videos, photos and info. Stay tuned for more great events in 2018! KUDOS TO OUR WEEKLY WAG editorial team for making it happen: Annie Cooperman Associate editor, Danny Altman, Tom Keefe, June Cooperman, and Wag Founder Suz Lipman. CHECK THEM OUT! : Much of MVCAN's work is done in one of our 10 awesome action teams. Click the team name to read their latest news and find their next meeting. Dump Trump's 25 active team members work on ways to remove Trump from power, with special focus on our petition to impeach him. We encourage all MVCAN members to go to our web page and sign the petition.